Yesterday was the official opening date for the Willow Draw Charity Show, which is the kick-off to the Stephanie and Moe reunion tour. The show is just over a month away, but I’m already trying to make sure we’re prepared. I’m vacillating between extreme anxiety and extreme excitement. Let’s start with the entry form. I had to look up the referenced USEF rule on trainers. (It turns out that yes, you can be your own trainer! Good thing, or my barn owner would have been surprised to learn of her new position in my life.) And let’s not talk about how embarrassingly old the “Horse and Rider Experience” section made me feel. Turns out I haven’t been to a USEA-sanctioned horse trial since 2007. 2007. That is nine years ago! In addition to feeling very old and very feeble, I felt very stupid for having to look up what the USEA Starter Fees were for; I thought they might be for people competing in the Starter division. I was wrong. Per the rulebook, “Competition Starter Fees are a tariff imposed by the USEA on each starter in USEA recognized competitions.” I had no idea we eventers were fancy enough for tariffs. Eventing dressage legal? We’ll find out! Of course, all this digging around in rulebook made me paranoid curious about the rules regarding dressage apparel. You may recall that I bought a Kerrits Competitors Koat in the lovely jasper green shade a few months ago in anticipation of going to real shows this year. I’m very familiar with rules regarding apparel at dressage competitions thanks to my job and had kind of assumed they were the same for eventing dressage. Surely eventers aren’t more conservative than dressage queens. The USEF’s eventing rulebook states “Coat- dark color or tweed, tail coats are not permitted;” which isn’t very helpful. WHAT’S A DARK COLOR? Like, can I wear dark purple? Dark red? I’m going to wear the green coat anyway, because a) there’s no way I’m sweating to death in my black wool hunt coat and b) it’s going to look freaking fabulous on my chestnut horse. Lots of technological advancements have been made since I last competed nine years ago, one of which is the development of MyCourseWalk.com, a delightful website where you can browse user-uploaded cross country courses from around the nation. The prizelist described Willow Draw’s course as “Average, for horses with some experience at these levels,” so I thought I’d take a look at what we’ll be facing. I don’t particularly worry about Moe, since cross country is his strong point, but it’s nice to be prepared, right? Turns out there are no courses from Willow Draw on MyCourseWalk (is this the inaugural year for it?) and the place’s website and Facebook page have zero photos of cross country jumps. Fortunately, I’m planning on trekking out to Feather Creek this weekend for schooling, so we’ll just jump every possible thing there and hope for the best. This cheerful face leaves me with no worries about XC. Moving on to our worst phase, in the interest of thoroughness, I thought I’d do some homework on the dressage judge. Through Dressage Detective, I discovered this judge scores an average of 62.995% on tests and is ranked 140th in generosity. (This data is a couple of years old, though.) If we end up with something sub-40, I will be completely happy. If we improve on our last USEA recorded dressage score of 43.0, I will be happy. Hell, if we score one 7 and don’t get disqualified for wearing an inappropriate jacket, I’ll be happy. The test is USEF Novice Test B. This test mercifully has only one coefficient (for the free walk), one halt, and a generous margin for picking up the canter. It’s also short compared to the First Level tests I’ve been doing on Gina, so I ought be able to memorize it without a problem. Various other preparations I’m making include waffling on buying Moe his very own dressage bridle (he wears Gina’s on the very last holes when he needs to look like a dressage horse), waffling on buying Moe a breastplate (because he needs to look cool, amiright), and scheduling a haircut so my helmet will fit again. 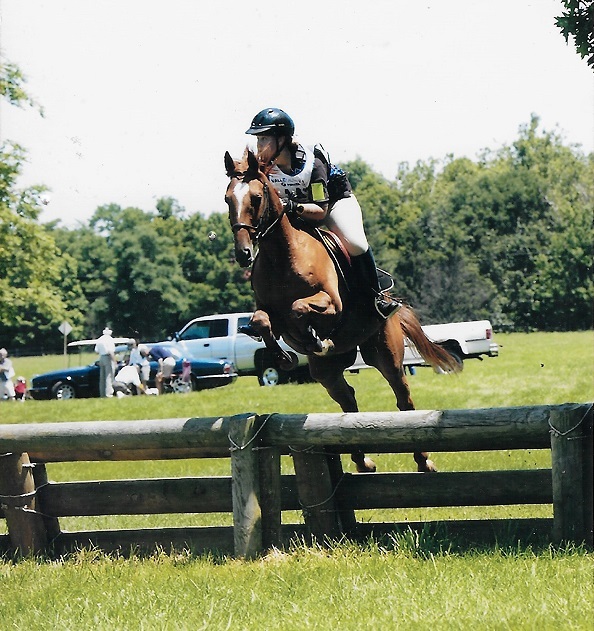 While I’m definitely a little nervous at the thought of going to a USEA horse trial again after nearly a decade, I think I’m more excited than anxious. After all, I haven’t been doing nothing for the last nine years. I’ve played polo, foxhunted, work hard on dressage, and even competed in a few schooling events! I’m looking forward to seeing a new course from my favorite old perspective. My mind is spinning in so many different directions after reading this. How do you guys keep it all together!? And…tariffs?! What is this, medieval times? That’s what I thought when I saw that! Can’t they call it something less silly? I cannot take a tariff seriously. I think MyCourseWalk has been around for a little bit, I vaguely remember Amanda using it last year, but you’d have to check with her to be sure. Good luck! I can’t wait to wear it! It’s such a pretty color and seems to be a flattering cut. I heard of MyCourseWalk from Amanda, and now I will definitely have to add the Willow Draw course to it when I go. MyCourseWalk is my favorite thing ever. LOVE IT. A lot of people use it, however a lot of people also forget to make their walks public, so they don’t show up on search results. However, yes this is the very first event to be run at Willow Draw, so that’s why you aren’t finding any history for it. And yes, the green coat will be fine. Willow Draw should be good I think, they’re limiting entries so it won’t be very big. Yeah, I saw they’re limiting it to 100 entries. I’m glad it’s only one day! By comparison, there are 90 horses just in NOVICE at Holly Hill. NINETY!!! 32 are in SNR alone. WTF??? Aw! So exciting! You guys will do just fine, I’m sure. Especially because Moe is going to enjoy being a derpy show horse too much not to enjoy it! He loves being a derpy show horse. Or just a derpy horse in general. I’ll have to make sure to bring a couple dozen donuts with me. I’m so excited for you and Moe!! 🙂 EEee! Aw, thanks! I might be up your way later this year to compete! I’m so happy Moe gets to go out there and show off his stuff again! Let’s be real here, only one of us is mildly anxious about the thought of competing at real shows again, and it’s not the one with 4 legs and a tail. In Moe’s mind, he probably competed yesterday. Have fun at the show. I hope the green coat is a go. 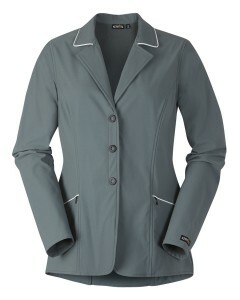 I have the blue version of that coat and plan to wear it to dressage shows and schooling events. Of course, I can’t legally even ride at a rated USEA event so I haven’t looked at all their rules. I didn’t know tariffs existed. The USEA’s stance on mules is really silly, and I hope it’s changed soon. I can’t wait to see you in the blue coat at dressage shows! I swear I saw that coat advertised as “USEA DRESSAGE LEGAL IN ALL COLORS!” including annoying caps… but I can’t find the reference today. Will keep looking. Hell yes to the green on a chestnut, and can’t wait to hear how the Stephanie / Moe tour goes! From the kerrits site: All colors are approved for use in USEF/USDF dressage competitions! I don’t think I’d be too nervous with a horse that seems that happy about cross country either. His exuberance is just too cute. He inspires such confidence! 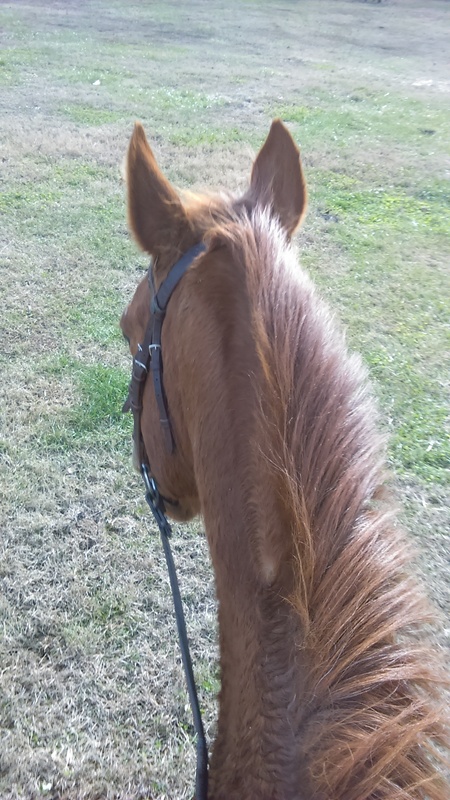 I mean, he’s a small horse (around 15.2), a weirdly put together horse (ewe neck, too-small head, a little camped out behind), and now an old horse, but I swear I could point him at a Rolex jump and he’d find a way to get over it. Good luck this weekend! Love the green coat! Thanks! I’m excited about going XC schooling. There aren’t many opportunities to do so around here (and this venue is about 2 hours away), so I’m sure I’ll feel more confident with some jumps under my belt! How exciting!! Moe is going to be awesome!!! How exciting! You’ll be fine in your grey coat! Yay! Moe is probably already excited. Don’t forget the donuts! I would think you should be ok with green. But then again, I know nothing about dressage. I do know I can’t wait to read your recap!!!! I would totally consider that coat a dark color. IMO, you’re good. Good luck! yay!!! This is so exciting, I’m sure y’all will do great. Reef and I have our very first BN recognized show next weekend and our goal is to not be eliminated lol. Also, I’m not sure about the green coat thing but I have a feeling you’ll be fine with it! I was so bummed when I saw that the Kerrits Koat was available in that lovely color. I just bought it last year in boring black, if I had known there were awesome colored version of it I totally would have gone for those instead. Dressage Detective is kind of a cool resource!